Mt. Gilead Baptist Church has come a long way since the organization in 1850 of a small band of Christians who came together with love and prayer and built a church near the banks of the Aucilla River in Jefferson County. Beginning with six members they worshipped under a brush arbor during the building of the church. On October 12, 1850, the church was admitted to the Florida Baptist Association. Rev. Z. G. Wheeler was the first pastor. The original building was set at Spring Branch, and when the county was divided, and Taylor County came into existence in 1856, Mt. 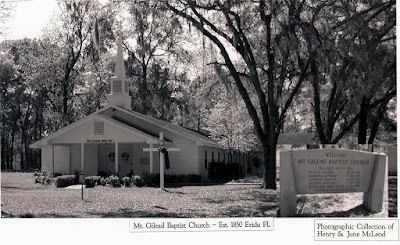 Gilead was the oldest church and is now in the Archives of Florida as the oldest church in Taylor County. In 1902, the church became affiliated with the Middle Florida Association. From the time of organization to the present time, the families and descendents of the Aman’s, Eakin’s, Ream’s and Vann’s have sought to teach the Bible doctrine. The church was moved out to the present location, on land later acquired by J. O. Vann, where the building burned in 1928 and all the records were destroyed. Another arbor was used for worship while a new building was being built and furnished in 1929 with a seating capacity of 100. In 1945, the land was sold to Loomus and Clyde Jones and they in turn deeded the land and church building and surrounding woodlands, approximately 5 acres, to the church with hopes a cemetery would be built. On August 20, 1950, a centennial anniversary was held with Brother Francis Cruce as pastor. Over the next 25 years the services would wane. The Aman, Campbell, Will Kemp, and Gelzer and Oby Vann families helped keep the doors open, and in 1975, a 125th anniversary was celebrated. From 1975 to present time, we have membership from charter families of Thomas Aman, Joshua Reams, George Eakins, Emory Vann and Campbell’s. The church transferred from Middle Florida Association in 1972 to the Taylor Baptist Association, as the church is located at the northern tip of Taylor County. The church was waning again, but the Lord opens doors. In 1978 and 1979 the woodlands to the south was cleared and a cemetery is now open. The donor of the land to the church was the first one to be laid to rest where his dreams finally were reality. On Sunday, September 7, 1980, was Commitment Day, held with dinner on the ground, and a ground-breaking service for a new sanctuary. With the help of friends, associational mission brothers and our own people, the building was dedicated to the Lord on August 16, 1981. We have now set the 3rd Sunday in August as an annual homecoming day. Pieces of furniture that has a seating capacity of 200 have been given in memory of loved ones. We have hopes of a baptistery and steeple to come later, A beautiful sign has also been donated which is an inspiration to all of us. The Lord has tremendously blessed us and hopefully we’ll soon be debt free.